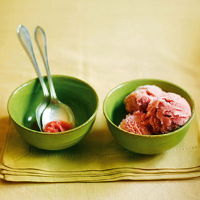 This adult sorbet was inspired by the aperitif of the same name. The oranges’ dark colour and slightly bitter taste perfectly complements the flavour of the Campari. Make a syrup: put 250ml water and the sugar in a pan over a low heat; stir occasionally until the sugar is dissolved. Increase the heat, bring the mixture to the boil, then boil for 2–3 minutes. Take off the heat, leave to cool, then chill. Combine the syrup with the orange juice, lemon juice and Campari; chill again until very cold. Pour into an ice-cream machine and churn until frozen. Transfer to a lidded plastic container and keep in the freezer until ready to serve. Transfer the container to the fridge about 30 minutes before serving.